Great Tasting watermelon bubble gum. 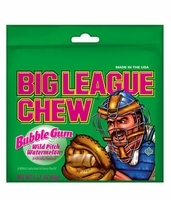 You can buy all your favorite flavors of big league chew gum in either single pouches or by the whole box. Pick from original bubble gum, sour apple, watermelon or grape. Shredded bubble gum in a cool foil pouch. This is the perfect summer time gum. It helps keep your mouth from getting dry, that is what the baseball players like about this.